On December 5th, 2018 at 10 AM EST Scholastica is hosting a free webinar—“How to Start or Flip an Open Access Journal: Publishers and editors share their stories.” Click here to register to attend the webinar and receive a link to the recording! Are you working with an academic institution or groups of scholars to start an open access journal or transition a paywalled journal to an OA publishing model? You’re in good company! Today, academic-led publishing initiatives are on the rise with many examples of learned societies, universities, and groups of scholars publishing OA journals. With the transition to online publishing, the introduction of affordable digital publishing tools and services, and mounting community support there has never been a better time for academy-owned journals to thrive. And with Article Processing Charges (APCs) rising fast, now averaging $2,000, the need for more affordable OA publishing models rooted in the interests of the academy has never been greater. By starting academic-led OA journals and flipping paywalled journals to OA models, the scholarly community is taking back control of research copyright and costs, and introducing much-needed competition into the publishing landscape. We share some details about the academic-led publishing initiatives that each of our guests will be discussing in the sections below. Jaclyn works in the trenches of the Michigan Publishing program building out Michigan’s service offerings and supporting those who use them, including many OA journals. During the webinar, she’ll be sharing examples of journals started at Michigan as well as different OA publishing models and approaches to consider. 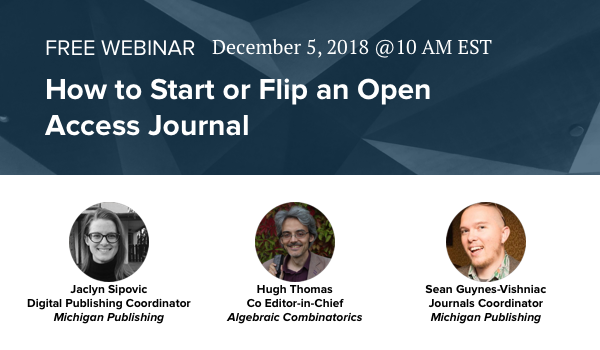 In the second half of the webinar, Hugh Thomas will discuss journal flipping. The term “journal flipping” refers to transitioning a paywalled journal to an OA publishing model. In recent years, there has been a rise in journal flipping as shown in the “Journal declarations of independence“ list on the Open Access Directory website. Hugh worked with the former editorial board of the Springer-owned Journal of Algebraic Combinatorics to start a new equivalent OA title Algebraic Combinatorics. During the webinar, he will discuss the benefits of flipping existing journals and how to approach “flipping” a title that’s owned by a corporate publisher. You can learn more about Hugh’s experience on the SPARC Declaring Independence website. Be sure to register for the upcoming webinar to receive the viewing link as well as a link to the recording! Do you have specific questions about OA journal publishing that you’d like the speakers to address during the webinar? Let us know by using the hashtag #AcademicLedOA! You can tweet your questions to us at @scholasticahq with the hashtag #AcademicLedOA before and during the webinar. The guest speakers will be fielding questions after the main presentations. We caught up with PubMed Central (PMC) Program Manager Kathryn Funk to get answers to some of the most common questions that we hear from journal publishers about PubMed and the related literature databases at the National Library of Medicine (NLM), MEDLINE and PMC. Scholastica announces a new guide to help scholars and institutions navigate the many avenues for running academy-owned open access journals and facilitating community-led publishing models - The Essentials of Academic-Led Journal Publishing. Now if you use Scholastica Open Access Publishing, and your journal is listed in the Directory of Open Access Journals (DOAJ), you can have all of your articles automatically deposited into the index - get the details! As part of OA Week 2017, Scholastica had the opportunity to be a part of the University of Cambridge Open Access Week speaking series event Helping Researchers Publish in Science, Technology, Engineering and Mathematics. Here's a recap of Scholastica CoFounder and CEO Brian Cody's presentation on the rise of DIY OA journal publishing. Once a scholar finds your open access journal, what can you do to encourage them to come back? Here are four ways to get scholars to frequent your OA journal website with examples from Scholastica's publishing platform. Phil Page, editor-in-chief of the Journal of Performance Health Research, shares why they chose to use Scholastica Peer Review and Open Access Publishing software to run the publication and how Scholastica enabled him to quickly and affordably get the journal off the ground.